Holodance is a collaborative multiplayer virtual reality rhythm video game developed and published by narayana games for Microsoft Windows in which players can either dance with dragons to have an environmentally themed story unfold with each of the twelve levels, or play any osu!-beatmap in one of the fifteen environments available in free mode. 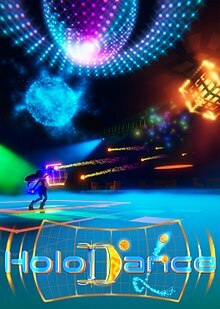 As a Virtual Reality rhythm game, Holodance can be classified as fitness game due to the requirement to move your arms and often the full body to interact with the gameplay mechanics, giving players a "workout". The game has been available as Early access title on Steam since April 5, 2016. Players interact with the rhythm of a song using their hands, which are tracked using motion controllers. There are currently three ways in which rhythm events are converted into gameplay: Catching orbs, following splines and spinning spinners. This mechanic is used for percussive instruments and puts attention to the timing when an orb is caught. For each note from the instrument track currently played, one orb flies towards the player from a greater distance and arrives in hands' reach in front of the player the exact moment that the note starts playing in the song. This location is marked by the outline of a sphere that glows up and down so that players know when they have to catch the note with their hand, and where. If players catch the note, they receive score depending on how precisely they matched the rhythm, plus a bonus based on how fast they moved their hand before catching the note, and another bonus based on the rotation speed of their hand before catching the note. The locations where the orbs arrive can be used to create a dancing choreography for the player. However, this mechanic only defines where the players have to have their hands at certain times. How the player actually gets there is up to the player, so it can be dancing but it can also just be hitting orbs, allowing the players to find their own way of expressing themselves in the game. When the player misses a note, that specific instrument is muted until he catches the next. This mechanic that has since used by many other Virtual Reality rhythm games was inspired by a gamejam project called E-Motion and first made public by Holodance in July 2015. Key screenshot of Holodance V0.8, in the environment "Virtual Clubbing", with gameplay (anime girl catching orbs). This mechanic is introduced in Level 4 of the story mode of Holodance. It is used for sustained instruments. The way this mechanic works is similar to catching orbs in the initial phase until a note starts: The floating spline flies towards the player from a distance and arrives near the player when the note starts. Once the note has started and is sustained, the player now has to keep following an orb that keeps moving along the spline path which is synchronized with the duration of the given note. That path starts when the note starts, and it ends when the note ends. The full spline path is visualized from the beginning, so the player knows where to move and by an orb following that path with the correct speed, the player also knows at what pace to move. This way, any hand movement could be choreographed. The score that players receive is calculated using how much of the time of the note their hand was actually inside the sphere while it moved along the path. This mechanic was first revealed in August 2015. This mechanic was inspired by osu! Spinners and implemented so that all mechanics of osu! beatmaps are also supported in Holodance. The main difference is that instead of moving their mouse, players need to spin the controller. Official Holodance V0.8 screenshot of the beach level (Level 01 in story mode). When players catch multiple notes without missing one, they get combo multipliers. After eight notes, the score of each successive note is multiplied with two. After sixteen notes, the multiplier is increased to three. Finally, after 48 notes without missing a single one, players receive the 4x multiplier. The game also has events after not missing a single note and catching 30% and 80% of the notes. How these effects are visualized is depending on the selected environment and not all environments support these events. Finally, a full combo, which means not missing a single note of the complete song triggers both an event and an achievement called No Note Missed. Official Holodance V0.8 screenshot of the first water level (Level 03 in story mode). In the story mode of Holodance, players experience environments on the land, in the air and underwater in various stages of environmental pollution. In the first three levels, the environment has not been touched by human influence, levels four, five and six illustrate mild pollution and the next three levels show severe impact of the influence of an industrialized human civilization. Other Virtual Reality projects use a similar approach (see). Official Holodance V0.8 screenshot of the last water level (Level 07 in story mode). UploadVR wrote after testing an early pre-alpha build that “the game was pretty darn fun ... both for me and those watching.” However, the article also addresses the issue of looking "goofy" while playing a VR game: "One thing you may notice about this video is that I do, in fact, look like a total goober to an outside observer while playing this game. This is not something that is a new phenomenon for VR, which regularly can make you look ... well a bit goofy." ^ Feltham, Jamie. "Holodance Dev Explains 'collaborative' VR Multiplayer". VRFocus. Retrieved March 27, 2017. ^ Hills-Duty, Rebecca. "VR Rhythm Game Holodance Gets Osu! Beatmap Support". VRFocus. Retrieved March 20, 2017. ^ Baric, Ivona (September 7, 2016). "Holodance Challenges Players to Dance with Dragons". Fitness Gaming. Retrieved March 18, 2017. ^ Feltham, Jamie. "HoloDance Hits Early Access, Gets Mixed Reality Trailer". VRFocus. Retrieved March 27, 2017. ^ Graham, Peter. "Update: Dance in Virtual Reality with Holodance". VRFocus. Retrieved March 27, 2017. ^ Feltham, Jamie. "New Holodance Gameplay Showcases Dragons And New Mechanics". VRFocus. Retrieved April 8, 2017. ^ Simons, Marlene. "Using Virtual Reality to Avoid Catastrophe". Popular Science. Retrieved March 18, 2017. ^ Mason, Will (August 8, 2015). "Dance like nobody else is watching with Holodance VR". UploadVR. Retrieved March 18, 2017. This page was last edited on 4 June 2018, at 19:20 (UTC).